University of Delaware professors Jules Bruck and Sue Barton have received the Land Ethics Award in the residential category from Bowman’s Hill Wildflower Preserve for their work on a sustainable demonstration project in the northern New Castle County community of Applecross. They were presented the award at the 15th annual Land Ethics Symposium on Thursday, March 12, at Delaware Valley College in Doylestown, Pennsylvania. 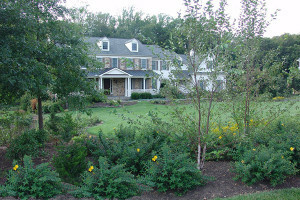 According to the Bowman’s Hill Wildflower Preserve website, the purpose of the Land Ethics Award is to honor and recognize individuals, organizations, government agencies, community groups and business professionals who have made significant contributions to the promotion of native plants and have exhibited a strong land ethic while promoting sustainable designs that protect the environment. For their particular project, the awards jury noted that the project “clearly demonstrated what can happen when several partners collaborate to change a sterile home landscape into one of environmental value. One can only think that the neighbors will be queuing up themselves to upgrade their own properties with similar projects.” Bruck, associate professor in the Department of Plant and Soil Sciences (PLSC), said the award carries great meaning. “I’m happy that it’s a Land Ethics Award and I think that’s just such a nice way to honor how designers can make a difference in land stewardship versus our traditional role, which has just been more aesthetic based,” she said. 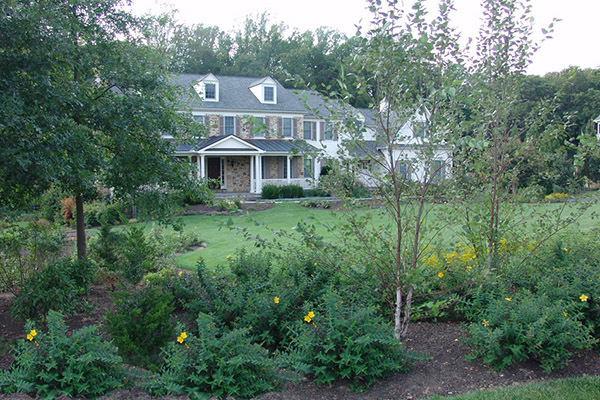 The Applecross demonstration project was designed and installed by researchers and students at UD and displays sustainable practices that reduced the lawn area of a residential yard by 50 percent while maintaining enough lawn for circulation, play and entertaining. The project began in April 2012 and, since then, those involved with the project have increased plant diversity by 500 percent, improved water quality and quantity on the property and planted the area with 95-97 percent native plants. The landscape also includes a 6,000-square-foot meadow and a 3,000-square-foot reforestation area. Turf paths wind through the meadow and landscape beds and connect large areas of lawn. “The idea was to show people that you can incorporate a meadow and a forest into a residential landscape,” said Barton, associate professor of plant and soil sciences. In addition to being functional, the landscape is also visually appealing, something that Barton stressed because she believes that sometimes when people hear about native landscapes, they think only of the functionality and not of the aesthetic appeal. “Almost all the plants are native and they’re quite showy. Sometimes native plants have a connotation of being less formal, less colorful, a compromise, and they’re not a compromise at all. It’s a very dramatic landscape. There’s almost always something blooming,” said Barton. Bruck added that while the landscape is quite different from the yards of the surrounding houses from a functional and ecological perspective, it doesn’t look that much different from the front, as most of the showy aspects are more toward the back of the property. “I thought it was really interesting that the sustainable landscape that we put around the entire house just didn’t look that much different than everybody else’s landscape,” said Bruck. “It wasn’t like a wild look. It wasn’t a messy look. It was well cared for, well maintained.” Bruck said that even though they used a large quantity of native plants in order to cover the ground and make it dense, the landscape is still orderly. “I think orderly is one of the things that doesn’t always translate when people think about native landscapes or ecological landscapes. We still use design principles to guide our placement of plants. They’re not supposed to be wild, messy landscapes just because they have native plants in them, and they are highly functioning landscapes,” said Bruck. In addition to being visually appealing and ecologically functional, the landscape also provides a great teaching tool for students and for members of the community at large, as there have been at least five public tours of the site. One of the tours was sponsored by the Pennsylvania Horticulture Society, and it attracted several hundred people. The last tour in October 2014 drew around 80 people. “Master Gardeners have gone and we’ve brought professionals there as part of the turf and landscape expo that we hold in Hockessin every November,” Barton said. When the project wraps up in August, Barton said the space can still serve as a learning tool for the future because of a large number of photographs of the project that are available. “We have hundreds of images of Applecross so that even though we can’t bring tours back to that site anymore, we have it documented in photos so that we can use that as an educational resource forever,” said Barton. Now that the demonstration site will be closing, Barton said that they are hopeful they can find space at the University to demonstrate how homeowners can incorporate a meadow or forest using native plants in a home landscape. The demonstration garden was funded by a grant from the United States Department of Agriculture (USDA) National Institute of Food and Agriculture (NIFA) that was awarded to Barton, Bruck, Joshua Duke, professor in the Department of Applied Economics and Statistics (APEC), Shreeram Inamdar, professor in the Department of Plant and Soil Sciences, and Doug Tallamy, professor in the Department of Entomology and Wildlife Ecology (ENWC). In addition to many volunteers, contributors to the project include North Creek Nurseries, Octoraro Nursery and Steve Gantz of All Seasons Landscaping. Article by Adam Thomas This article can also be viewed on UDaily.